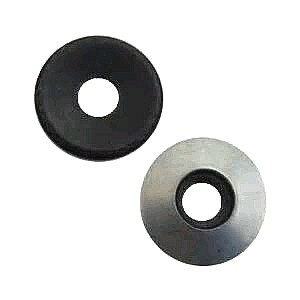 PRODUCT: #8/10 x 1/2 in OD EPDM Bonded Sealing Washer. 20 Gauge Hot-Dip Galvanized Steel with Bonded EPDM Rubber Washer. [~.470 OD x .200 Inch ID metal washer with ~.150 ID rubber washer). Fits #8 to #10 screws. Price/100. APPLICATIONS: Popular for use with #8 (4.6 mm) or #10 roofing or siding screws.